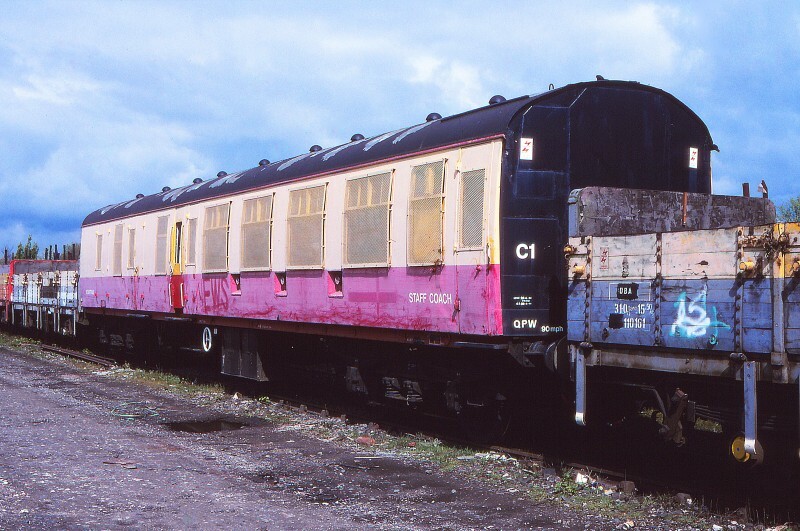 Martyn Hilbert's Railway Photography - Preston & District - Departmental Coach KDB977143 at Brownedge Sidings. Departmental Coach KDB977143 at Brownedge Sidings. In connection with laying new cable troughing, a rake of OBA open wagons was stabled in Brownedge Sidings, near Bamber Bridge on the 20th Aprfl 1998. In the consist was a former Mark 1 coach, KDB977143 in use as a staff coach. It was built by Metro-Cammell in Birmingham as part of lot 30229, allocated the number S34944, and delivered new to the Southern Region in October 1956 in Maroon & Cream livery. The area in the foreground was the site of the former down East Lancs line from Preston, closed in 1972.